At YardSurfer, we focus on nurturing and empowering the love of gardening, yards, our beautiful planet, and the outdoors. We’re also here to help you gear up for your outdoor work, providing tool and accessory reviews regularly. If you want to write a product review that will help other garden-lovers gear up, please do! 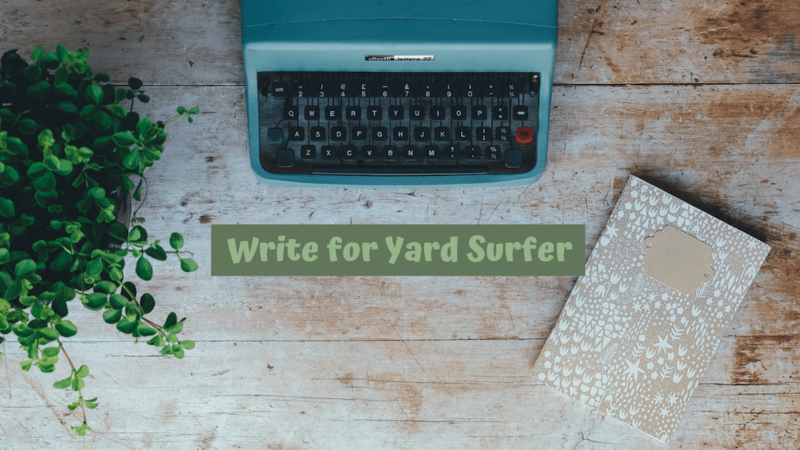 Yard Surfer is looking for expert writers, thought leaders, and those with green thumbs who have something significant to share. Included your name, email address, and your 3-5 sentenced biography at the top of your article. You are also free to include a link to your website, and your profiles on social media but they are not required! Written your post on an editable Google Doc and shared it with us. Included your PayPal email address. Once those things are complete, you’re ready to submit an article to us! Here are three of the many writing topic ideas you can use in your post. It doesn’t mean though that we are only confined and limited to these topics. Many people believe that only those with the so-called ‘green thumbs’ can turn their garden and yard green. Prove them wrong. Let your article be an inspiration to everyone who loves the greens and reds outside their home even if they don’t know how to. Teach them the art of commitment and dedication to what they’re doing. Are you a garden enthusiast who has a personal story to share? Write passionately about when you first started to garden or fell in love with your backyard. Share with the readers what you love about landscaping and what will help them enjoy the hobby, as well. Every garden aficionado, (especially the newbies and us frugal ones) like to hear authentic reviews of outdoor products. Give us tips about what gardening tools to use– tools that won’t hurt our pocketbooks. What makes a strong article? Your article is a strong one if you give tips that are practical for a broad spectrum of readers and focus on either DIY step by step instructions or personally, emotionally connective stories. Will I be paid for my submission? Yes, for accepted submissions we pay $30-40 depending on the editorial work required on our end. We use PayPal to send payments. The article should contain at least 900 words. Can I include links within my article? Yes, do include the links that will be relevant to your readers. Do not use paid, sponsored, spammy links, or affiliate links. What are your general style guidelines for posts? Wherever possible, the article should contain bullets, subheadings and numbered lists. Don’t use tons of uncommon words unless you define them. (We do love learning new words). Yes, we appreciate one or two suggestions, actually. We might tweak headlines for style, SEO, or merely to make your written work more catchy. Yes. We do edit for clarity and content purposes. However, we will do everything to preserve the spirit of your original writing and voice. Will I get any response to my email after my submission? Yes, if we are publishing your article we will let you know. However, unfortunately, we cannot use all of the posts we receive since we have a small editorial team. We do not reply to emails if we don’t intend to publish your work.